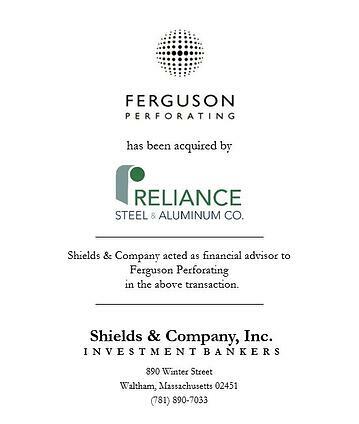 Shields & Company is pleased to announce the sale of Ferguson Perforating Company (“Ferguson”) to Reliance Steel & Aluminum (NYSE:RS) (“Reliance”) through its wholly-owned subsidiary, Diamond Manufacturing Company. Founded in 1927, Ferguson manufactures perforated metal parts for numerous applications in domestic and international markets. Ferguson specializes in producing highly engineered and complex perforated metal for diverse end markets ranging from aerospace and automotive to industrial machinery, consumer electronics manufacturers, and sugar producers. The Company is headquartered in Providence, Rhode Island and operates an additional facility in New Castle, Pennsylvania. Reliance CEO Gregg Mollins commented, “Ferguson fits solidly into our growth strategy of acquiring companies with high value-added processing capabilities and furthers our product diversification. The Company is a very well-respected perforator and is known for its ability to provide highly customized and complex processing solutions. Ferguson’s skills complement our existing perforator company, Diamond Manufacturing, and we look forward to the potential opportunities that may arise as a result of this acquisition. We are very pleased to welcome Ferguson to the Reliance family of companies and to expand our presence in this important niche market." Evan Ricker, Tom Shields, and Christian Sampson from Shields & Company served as the exclusive financial advisors to Ferguson Perforating. Stephen Carlotti, Margaret Farrell, and David Hirsch from Hinckley, Allen & Snyder LLP served as Ferguson’s legal advisors on the deal. Shields & Company acted as a financial advisor to Ferguson Perforating Company in the above transaction.